Order your own copy of these Realms of Terrinoth Adversary Decks at your local retailer or online through our website today! Terrinoth is filled with diverse denizens that truly bring the realm to life. These Elves, Dwarves, wizards, and more await adventurers in the land of heroes long past. But danger also lurks around every corner. Monsters haunt the land of Terrinoth, ready to strike at a moment’s notice. Will you be prepared? 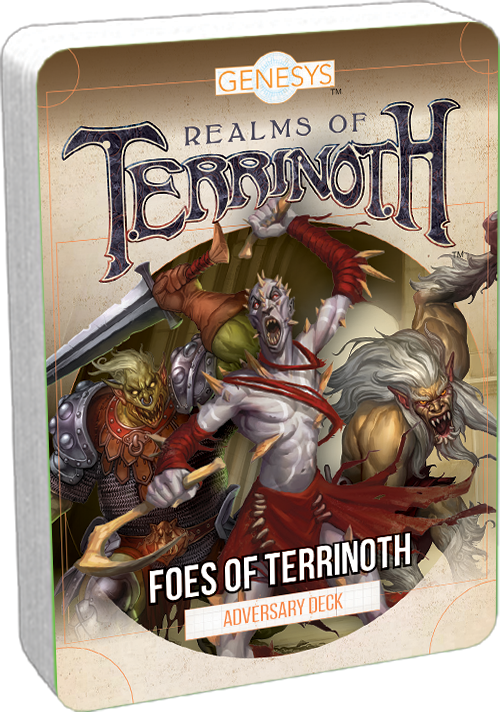 Fantasy Flight Games is proud to announce the Denizens of Terrinoth Adversary Deck and the Foes of Terrinoth Adversary Deck! 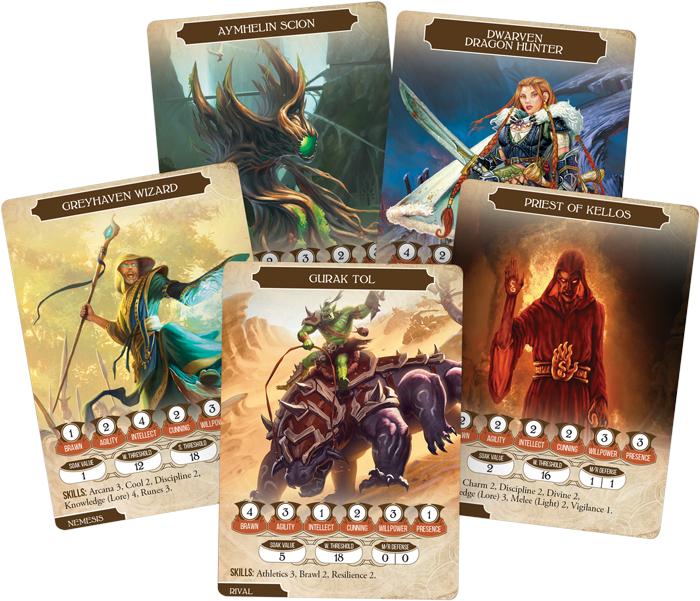 Each of these Adversary Decks offers you a convenient and portable way to track the allies and adversaries found in the Realms of Terrinoth supplement for the Genesys Roleplaying System. If you're taking on the role of a Game Master, the perfect enemy or future friend is only a moment away with these two Adversary Decks. The Denizens of Terrinoth Adversary Deck features beings of Terrinoth as diverse as the wonderous lands themselves. Adventurers may encounter scholarly Greyhaven wizards, mysterious Latari Elves, gruff Dunwarr Dwarves, and more. The Denizens of Terrinoth Adversary Deck is the perfect tool to bringing these unique characters to life in your campaigns, whether they serve as companions to the players or unexpected rivals. 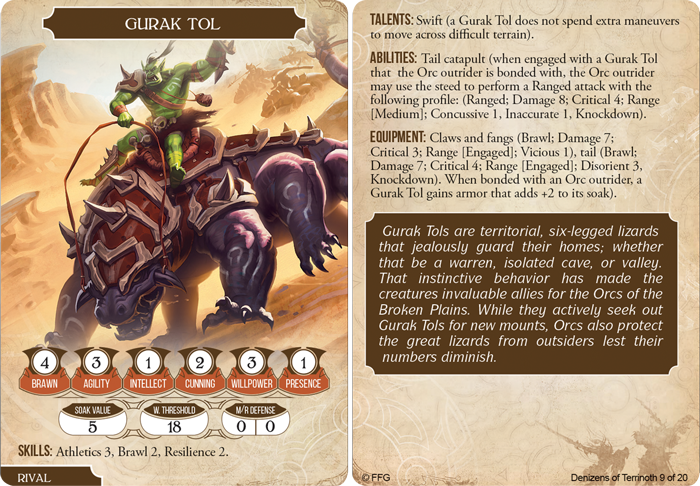 Meanwhile, the Foes of Terrinoth Adversary Deck focuses on the terrifying creatures that adventurers might encounter on their journeys. Ghastly undead creatures, ravenous monsters, ferocious dragons, and horrific demons lurk in the darkness of the land. Adventurers must always be prepared when exploring forgotten treasure vaults and castle ruins, for it's a certainty that they won’t be alone! Boh of these decks feature fully statted non-player characters included in the Realms of Terrinoth supplement, and they allow you to keep these characters' stats easily in front of you in the form of cards. These cards give you everything you need to run an organized campaign, no matter how many NPCs your players encounter—and every card also features thrilling artwork, bringing the world of Terrinoth to life in your mind and the minds of your players. Each Adversary Deck includes twenty cards that detail an adversary's skills, talents, abilities, spells, equipment, and more, keeping your adversaries close at hand and combat moving fast. 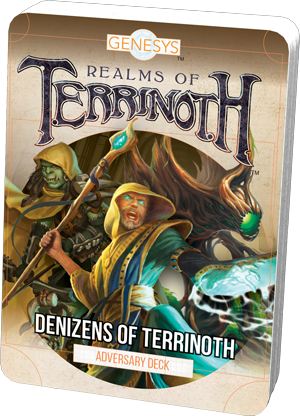 The realms of Terrinoth are at your fingertips! Explore Terrinoth with the Denizens of Terrinoth Adversary Deck (uGNS05) and the Foes of Terrinoth Adversary Deck (uGNS06), available now for pre-order from your local retailer or our website! Genesys is a unique roleplaying game that uses the critically-acclaimed narrative dice system to provide unlimited adventures in a wide variety of settings! Blast hordes of reanimated skeletons with holy fire, explore new worlds in a steam-powered zeppelin, match wits with alien warlords, or invent your own entirely unique world. With Genesys, any story can be told. One Book. Unlimited Adventures.